"I don't know nothing about the history of golf"
Boo: "I'm looking at the WCWs, the WGWs"
The Golf Watch's Richard Simon has posted a two-part Q&A with Jeff Babineau on the state of Golfweek, but even more fun than that is his his link to Boo Weekley's recent 19th Hole interview with Vince Cellini and John Hawkins where the PGA Tour's finest tries twice to refer to the WGC events, and fails. I don't think it's online, but that episode of the show also featured a priceless Hawkins rant about the 2018 Ryder Cup-to-Dubai talk. Boo Writing His First Book, Needs Publisher! Just think of the Walmart sales alone, publishers. Q. Did you know that the portable bathroom story was going to get asked about? BOO WEEKLEY: There was a couple different stories that he wanted to know, and I didn't know which one that he was going to bring out. So that was the one he picked. Q. And you had no problem telling the whole thing? BOO WEEKLEY: It was a true story, why should I have a problem? BOO WEEKLEY: Yeah, that will be coming out soon, though. It will be out later, a couple months. Q. (Regarding writing a book). 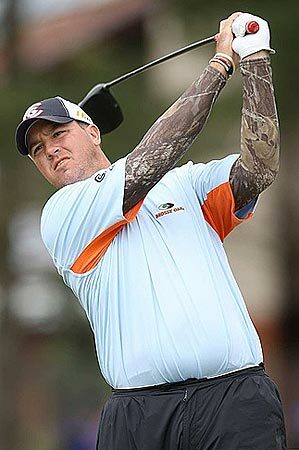 BOO WEEKLEY: I think his name's Paul Brown out of Jackson, Mississippi. We are working on one right now. We are trying to find a publisher that might be interested in it. You know, going to be a lot of different things going on. Q. What's the working title? BOO WEEKLEY: Don't know yet. He's coming up with all that. We just trying to start out -- we are trying to start it out and just trying to -- of how I got into golf, you know, and what my past has been like and the things that I've come about and the thing that I've overcome, just different things like that. It's just mostly about golf, right now until we find a publisher and then I started throwing some other stuff in there. Q. There was a story a couple of weeks ago SI wrote and they quoted your dad as saying you know a lot more about golf than you let on; that you watched golf more as a kid. Just talk about that. BOO WEEKLEY: Daddy's full of it. (Laughter) Daddy wasn't never there. I mean, he was there, but like he said, I read a bunch of Hogan books; I read two Hogan books, and they were my neighbor's; he said I probably read every Hogan book there was, I think somebody quoted him saying. And you know, and now I do watch a little more golf but I mean, that ain't nothing -- if I'm laying around the house at night getting ready to fall asleep I'll flip over and see what is golf, what is on, but I ain't going to sit there and just watch it. The Boo Files: "If you ain't ever done it, you need to try." They lured Boo Weekley into the Wachovia press tent to talk about his test driving a NASCAR, one of the player perks this week. Q. What did you do this morning? BOO WEEKLEY: I went and drove them NASCARs, them speed cars over there at the Motor Speedway here in Charlotte. It was awesome. If you ain't ever done it, you need to try. Q. How fast did you get? BOO WEEKLEY: The first session I went, I went like 138, 134, something like that, and then the second session I think I got it up around close to 150. It is very exciting and very tense. I've got a new perspective of how them guys go about the driving. Q. Is it just the speed or the bend? BOO WEEKLEY: It's the whole thing. You get a vehicle that's probably more expensive than what I own at the house, everything (laughter), you know, if you pile that thing up in the wall, you can't just say, hey, I'm sorry (laughter). It was kind of nerve-wracking, you know? Q. Can what you did this morning in any way help you out on the golf course? BOO WEEKLEY: I don't think so. I don't know (laughing). It might help -- I think some of the guys need to go out there that are slower players; maybe they'd learn to speed up a little bit (laughter). Q. Did you play with Trevor the first two days at Augusta? BOO WEEKLEY: I did indeed, sir. I talked to his caddie Neil a while ago, and it was kind of amazing. I saw a little bit of it as we were playing because very rarely -- when you get into a zone or when you get into where you're actually feeling comfortable over what you're doing, but Trevor, the first two days I played with him, he looked so just focused, confident, the whole nine yards, and it's amazing that you very rarely see that as a player. But when you look at it and you see another player doing that, you're like, man, I wish I could get where he's at, in that comfort zone. I think a lot of it had to do with what happened for me the following week at Hilton Head is because I actually was focusing on a lot of the stuff I saw him doing. I kind of tried to get myself in that position, and it was neat. The Boo Files: "This golf is a crazy game. That's why I only want to do it for so long and get out of it." Boo Weekley successfully defends his Heritage Classic title, drops three aint's and two reckons, and as usual provides more transcript entertainment than the rest of the PGA Tour's finest combined. Q. Did you ever doubt yourself today? BOO WEEKLEY: Yes, once or twice I did. I mean, I just kind of aggravated -- like on 10, I got probably the lowest point I got all day was on 10. They just put us on the clock, you know, we're under two minutes or two hours on our time, you know, and it's kind of hard to believe they had us on the clock. The guys in front of us were playing pretty quick. It kind of got aggravating and, okay, there you go, you kind of give it away now hitting shots like that. That was my lowest point. It was the guys in front going fast, not Boo and buds playing slow. I like that rationalization. BOO WEEKLEY: No, ma'am, I had the rights all day. I had them all week with the driver and a little bit with the iron. I was standing on the tee box or on the practice round this morning and I had the pulls. This golf is a crazy game. That's why I only want to do it for so long and get out of it (laughter). BOO WEEKLEY: I'm pretty sure I do. I hope it's mostly the kids. That's who you want to touch anyway is the kids. And I hope they don't chew. I was standing behind the 18th green at the end of Saturday's round when CBS commentator Jim Nantz climbed down from the telecast tower and ambled toward the players' scoring trailer. I talked to him for a minute but he was interested in getting some face time, he said, with Boo. They had never met, Nantz said. When Boo signed his card and came out, Nantz was there to introduce himself and have a short, smiling conversation. Later, after Boo finished another rollicking interview session in the press tent, I asked him about meeting Nantz. "Wail (that's southern for "Well"), he said he just wanted to put a face with a name," Boo said. "He was real nice." "What was the conversation about?" I asked, "Did he ask any deep questions?" Boo shook his head. "I don't even know what he does," he said. "He's a golf commentator," I said. "I'm sure you've heard him on college basketball or football." "Wail, either I don't watch much of that or I just don't listen," he said, non-plussed. "Whenever I think I feel like I need one or get tired of spitting white stuff." Q. Did you play the entire round chewing tobacco? How often do you do that and what does if do for you in a round of golf? BOO WEEKLEY: I don't think chewing tobacco is the whole key, I just like to spit a lot, you know (laughter). Kind of have to have something in my mouth, I reckon, like a Jolly Rancher or something. I didn't have it in there the whole round. I put it in a couple of holes and throw it out a couple of holes. It's just back and forth. Whenever I think I feel like I need one or get tired of spitting white stuff. The Boo Files: "I didn't know after Houston was Augusta." Where to start? How about this: Boo Weekley should be required to come into the press room every week. Who else is this entertaining? Here are a few of the highlights from his pre-Honda Classic press conference, though I can recommend reading the entire transcript. It beat most other online reading. BOO WEEKLEY: It gets kind of aggravating but it's still fun. All them people that you talk to outside the ropes, and they wish they could be here. They wish they could be the one walking inside them ropes and talking to all them people and just being in my footsteps. It's kind of an honor to say that, hey, I'm inside the ropes and this is what I do for a living. On his preparing for his first Masters...starting by knowing when it starts. BOO WEEKLEY: No. My first trip going to Augusta, I didn't even know when it was. I was going to play all the way through to Houston, you know, and then take the week off. I didn't know after Houston was Augusta. Q. So what are you going to do? BOO WEEKLEY: Oh, I'm going to take two weeks off now before to get ready. But I reckon I can get ready. I reckon I just go home and do some turkey hunting, that's how I prepare. Q. Did you watch many Masters going up? Do you have memories of a great Masters? BOO WEEKLEY: The one that Tiger when he chipped it in the ball, on whatever hole that was. Q. Do you watch golf on TVs? BOO WEEKLEY: I'm not a big golf watcher. I know I'm supposed to be representing the TOUR, but I'd much rather be watching NASCAR. Q. What do you think of the Bear Trap holes, 15, the par 3, 16, the par 4, and then 17, the par 3? BOO WEEKLEY: You know, I just found out that was called a Bear Trap earlier today. I didn't even know it was called a Bear Trap. It's pretty good. Q. Do you see why they have a name for it? BOO WEEKLEY: No. I don't know, I just go and play golf, dude. If it looks like a tough hole and I hit it in the fairway, I'll turn around from the fairway and look back at the tee box and try to pick a line, you know, and say, okay, if I can start it on this line, and whichever way the wind is blowing, it should be good, it should be in the middle of the fairway if I can start it on that line. I look at the golf course backwards in a lot of ways and a lot of players do.